Gluskin Sheff + Associates Inc.is one of Canada’s leading wealth management firms. The firm caters to high net worth private clients and institutional investors, providing investment strategies across equity, fixed income and alternative asset classes. The firm follows an investment philosophy of bottom-up security specific fundamental analysis and top-down macroeconomic view. It operates through a dedicated team of 29 investment professionals, having a collective industry experience of over 450 years. With more than three decades of experience in the finance industry, Gluskin Sheff has inculcated prudent wealth stewardship. Clients trust the firm because of its prudent investment advice, exceptional client service and customized investment portfolios. In order to better serve its clients, Gluskin Sheff offers a range of portfolio models and a wide spectrum of investment strategies. About 89% of its assets are managed on behalf of HNI private clients including family trusts, professionals, estates etc., while the balance 11% of its AUM is managed for institutions. Approximately 88% of the firm’s AUM is from client relationships in Ontario, Quebec, British Columbia and Alberta. Gluskin also caters to clients in other Canadian provinces and outside of Canada. Gluskin Sheff has successfully grown its AUM from $26 million in 1984 to more than $8 billion today, registering a compound annual growth rate of more than 18%. Its revenues include a base management fee and performance fee component. The firm charges between 0.75%-1.5% of base management fee per annum on its HNI private client AUM on a monthly or quarterly basis. The firm claims a base management fee at 1.24%, which has remained stable over the years. Performance fees are earned when the firm exceeds pre-specified rates of return, and are paid once in each year. One of the major competitive advantages of a financial firm is its ability to attract and retain clients. In this regard, Gluskin Sheff has developed long term relationships with its clients by providing them with timely advice and solutions on their portfolios. The firm enjoys an outstanding reputation in the Canadian HNI private client market. Strong long term investment performance and disciplined investment approach have gone a long way in retaining clients. With decades of experience in the business, Gluskin Sheff has developed a deep understanding of its clients’ financial needs and looks for innovative ways to offer them value added services. The firm is also growing through acquisitions.The acquisition of Blair Franklin Asset Management in 2014, added specialized risk management capabilities in Canadian and global fixed income markets. Gluskin Sheff has registered a dividend growth of 26% CAGR over the last decade. Its last dividend hike was 11%. The firm has a high dividend yield of 9.6% and a high payout ratio of 76%. Currently the annual dividend payout stands at $1. This Dividend Aristocrat also pays special dividends from time to time. The firm also has a share repurchase program in place. As one of Canada’s largest non-bank private client wealth management firms, Gluskin Sheff has a solid track record of strong long term investment performance and aims at delivering superior risk-adjusted returns to its shareholders. According to the company’s website, $1 million invested with the company at inception would have nearly doubled by June 2018. In order to retain its leading position in the client-centric industry, Gluskin Sheff is focusing on wealth management and revamping its website and client portal. 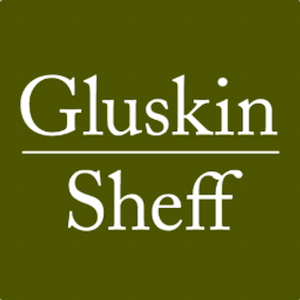 Gluskin Sheff serves a small portion of the private client market and has a huge potential going forward. The firm offers diversified investment products consisting of portfolio models including a broad range of issuers, currencies and geographies. This further helps clients to hold investments across a broad range of the risk spectrum. Gluskin Sheff should continue growing its dividends given a stable fee rate and AUM. The investment management industry is becoming more competitive with each passing year. The firm competes with other investment management firms, banks, insurance companies and other financial institutions. Moreover, many foreign firms are also aggressively entering the Canadian marketplace and pose a threat to Gluskin Sheff. But given its strong reputation, solid footprint across geographies and loyal customers, Gluskin Sheff continues to enjoy a leading market position. Solid investment performance and a top client service will go a long way in growing Gluskin Sheff’s assets under management. With high net worth private clients and institutional investors as its clients, the firm enjoys a regular stream of income. Diversification across geographies and investment philosophies further guards the firm from market volatility. Given its leading position in Canada, Gluskin Sheff is well positioned to benefit from an aging population as well as their growing need for wealth management, This should help continue its dividend payment streak in future.